And even though every kid wants a superhero power, Charlie isn’t keen on changing into a chicken in the middle of the school play. So with the help of his three best friends, Charlie needs to find a way of dealing with his crazy new power – and fast! Charlie Changes into a Chicken is the debut novel of Sam Copeland, and the first of a three-book middle grade series. It has received a lot of hype in the UK, where it was published originally by Penguin UK, and Copeland has even been compared to Roald Dahl and David Walliams. The author’s ability to write humorous characters, situations and scenes has a lot to do with this. 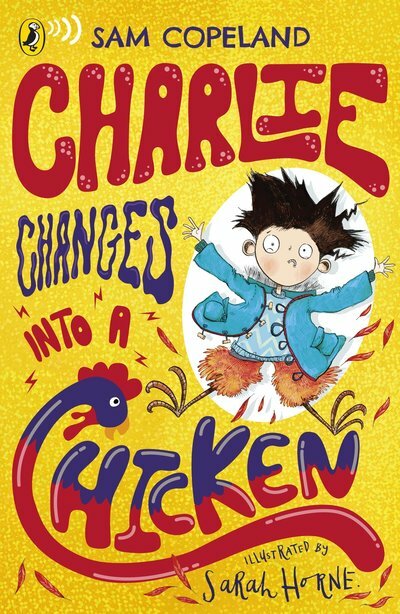 There is plenty for kids to giggle about throughout, from incidents involving rhino poo to love-struck French-sounding pigeons and the need for the main character, Charlie, to do a very long pee into some pot plants. However, on top of the funny situations, Copeland also addresses some more serious issues, which the bright, fun cover design and variety of comical black-and-white illustrations throughout the book (wonderfully created by illustrator Sarah Horne) won’t make obvious to kids on picking up the book. As such, this is an interesting mix that I see as providing a good way “in” for young readers who don’t want to be overwhelmed by really serious subject matter but who are mature enough to consider common problems which children and adults alike can face. This includes stress and anxiety, and dealing with the sickness of a loved one. The book also explores other valid themes, such as bullying, friendship, families, working together, loyalty, and stage fright. This is all kept reasonably light, though, and Charlie is able to lean heavily on the support of his three best friends to help him get through what he is facing. There are two elements in this novel which I found interesting, particularly for a younger middle grade book (the text is large and there are many pictures, so this keeps it for the younger end of middle grade readers). Firstly, there is the way in which the author breaks the fourth wall in various parts of the book, including in the beginning pages and in the end “Q & A” which is written and answered by the author. Secondly, there’s the inclusion of footnotes (usually all very tongue-in-cheek!) in various spots throughout the novel. In general, the book is fast-paced and has lots of action to keep kids interested. The illustrations are very humorous and help to break up the text and also convey characterisation more. There are font changes to mix things up, too. Copeland has been very clever in the mixture of techniques he has used. In particular, I get the feeling that the use of humour, lighthearted footnotes, and the meta-fiction element will help children to put down the book after they’ve finished it with a great sense of satisfaction and pride, knowing they have been in on jokes and learnt new things at the same time. Another plus is that the characters are quite diverse, and even though there is only one key female character out of the main children featured, she is the cleverest and sassiest by far. This helps to even out the gender disparity somewhat. I’m not a fan of the characterisation of one of Charlie’s best friends as very dim-witted, as I think this is a bit heavy-handed. It seems to go against the anti-bullying theme that is expressed elsewhere, too. I think kids could get mixed messages, as a result. All in all, though, this is a really engaging, lively, entertaining book that will appeal to both boys and girls and keep kids reading from start to finish. The main character is relatable and genuinely likeable, and faces many situations children will be able to identify with – as well as one (his ability to change into animals) which they’ll wish they could find themselves in! This book is recommended for readers aged around 8 years of age and up. Please note: the publisher provided a complimentary copy of the book in exchange for an honest review. ← 500 FREE Books for Aussie Schools!